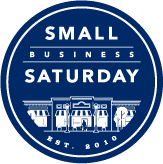 Tag Archives for " Small Business Saturday "
As you may have read here, I’m totally behind an initiative put forward by American Express OPEN and a growing list of small business advocacy groups called Small Business Saturday. It’s a small business focused effort that asks you to think about shopping at your local small business this Saturday. I’ve written a post with Small Business Saturday details here. As you may also know American Express OPEN is a client of mine, so some folks have asked me why OPEN is putting so much behind this effort. I had a chance to pose a few questions to OPEN President Susan Sobbott. What follows is our interview.